Atlanta receives a lot of rain distributed throughout the year. Summers are hot while winters are cool. Extreme weather conditions shorten the lifespan of roofs, particularly those that are not properly maintained. Verify the registration and insurance of the contractors. They must have licenses from the local authority and full insurance coverage over their employees and subcontractors. Potential litigation between you and the contractor will be avoided if insurance can cover injuries sustained by an employee. Look for roofing specialists who are certified by manufacturers. You are assured of quality workmanship from these roofers because they have to pass stringent conditions set by companies to be certified. Ask the contractors about their past projects and safety regulations in place. They must have sound safety programs observed throughout their organizations. Your roofing job could be unnecessarily delayed by accidents and injuries on the work site. Talk to at least three different contractors. Do not immediately agree to the first contractor that you met. Learn each roofer’s experiences and past accomplishment. Ask if they had any issues in the past and what were the resolutions arrived at. Engage the services of local roofing contractors. They have established relationship with local suppliers and crew and are likely familiar with local rules and regulations. Avoid signing contract without having thoroughly considered everything, including the cost of repair. Be wary of contractors pressuring homeowners to sign contracts even before the insurance adjusters inspected the roof and estimated the damage. Search the web for contractors’ ratings. A good score and positive review mean there is less likelihood of you contracting illegitimate companies. If possible do not hire contractors whose companies are not listed in legitimate business listing sites such as the Better Business Bureau (BBB). Engage the services of the contractor who had extensive experience with the type of roof you are installing. 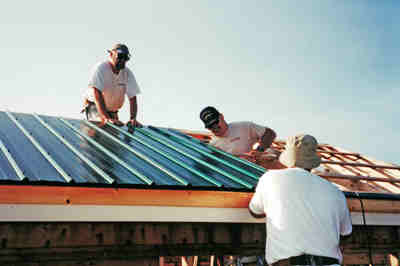 For instance, metal roof contractors must have at least three years of work accomplishment in installing metal roofs. Ask for extensive warranty for the contractor’s work. Some mistakes in roof installation are not readily apparent and could take years before they manifest. Unless the contractor agreed to the warranty, you could be paying for the damage since insurance will not pay for it.